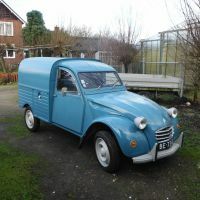 Always had that problem with my 2cv. Hadn't thought of cable ties though! Problem comes from the rubber tubes on the female plugs the dry out and don' t hold the other side in place. The Bedouin has spade connectors. I intend to replace the ones under the bonnet with with AMP waterproof connectors. Ahhhh almost looking like my garage.. I hope the new old gearbox will work.. Fingers crossed.. I love the indicators on the bumper . Is there a bulb in there or Led ? These are Belgian indicators made by ROG. They were used on a lot of vehicles from the 30s to the 50s. I buy them always on belgian fleamarkets if the are cheap. It exists also version with fixture under the light. Looks like an egg in an egg cup. For now i have LED lamps in them but i am not completly statisfied. I think real bulbs will do better as the orange glass is lens shaped. I worked some hours on it again today. Drive shafts are in, brakes are connected and bled, wiring is complete, clutch and handbrake cables connected. It did fire up but it started snowing in my neck so called it a day...(A suivre).